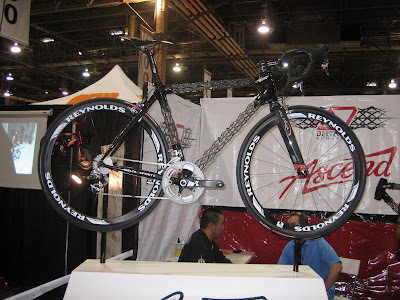 When we saw this bike being wheeled into the show one morning, Krista thought it was an accident waiting to happen and instantly dubbed it "The Cheese Grater." Interbike is so big (and some manufacturer booths are so secure -- Electra's actually had bouncers) that sometimes the best way to see the hottest bikes is outside the show -- in casinos, hotel elevators, coffee shops -- when they are being wheeled to and fro. Speaking of security, I guess companies figure the bikes are safer staying with employees after-hours than staying in the convention center.